Big Data is made up of lots of little data: numbers entered into cell phones, addresses entered into GPS devices, visits to websites, online purchases, ATM transactions, and any other activity that leaves a digital trail. Although the abuse of Big Data--surveillance, spying, hacking--has made headlines, it shouldn't overshadow the abundant positive applications of Big Data. 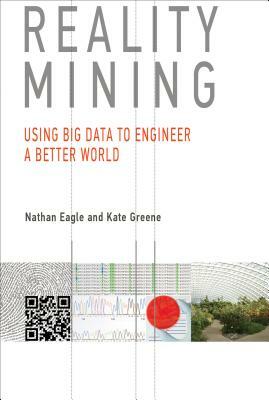 In Reality Mining, Nathan Eagle and Kate Greene cut through the hype and the headlines to explore the positive potential of Big Data, showing the ways in which the analysis of Big Data ("Reality Mining") can be used to improve human systems as varied as political polling and disease tracking, while considering user privacy. Eagle, a recognized expert in the field, and Greene, an experienced technology journalist, describe Reality Mining at five different levels: the individual, the neighborhood and organization, the city, the nation, and the world. For each level, they first offer a nontechnical explanation of data collection methods and then describe applications and systems that have been or could be built. These include a mobile app that helps smokers quit smoking; a workplace "knowledge system"; the use of GPS, Wi-Fi, and mobile phone data to manage and predict traffic flows; and the analysis of social media to track the spread of disease. Eagle and Greene argue that Big Data, used respectfully and responsibly, can help people live better, healthier, and happier lives. Nathan Eagle, one of the "50 people who will change the world" on the 2012 Wired Smart List, is the cofounder and CEO of Jana, a company that helps global brands reach customers in emerging markets via mobile airtime. He holds faculty positions at Harvard and Northeastern Universities. Kate Greene is a freelance science and technology journalist based in San Francisco whose work has appeared in The Economist, Discover, and U.S News & World Report, among other publications.